Last updated May 20th, 2004. A gas leak is a BAD BAD thing - you do NOT want these. You should check any gas line/appliance for gas leaks, and especially so if you have work done on it. You can buy a fancy-smancy gas leak detector ... or use this simple approach. 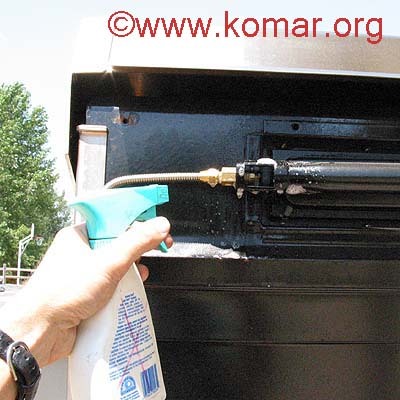 Both Propane (LP) and Natural Gas (NG) are quite smelly, due to the addition of odorants. If you are not familier with it, simply turn on your BBQ grill for a few seconds and take a whiff. If you ever smell this under normal operation, turn OFF the gas connection as soon as possible and remove any source of flame/sparks. If in doubt, just LEAVE and call 911. BTW, note that NG is lighter than air, so it will raise and disperse more easily out windows, etc. ... whereas Propane is heavier than air. So ... while smell is a great indicator of a gas leak, you should do additional testing ... plus if you have a gas leaks, you need to figure out where it is so you can fix things. I've seen some fancy "do-hickies" that actually detect the odor in terms of "strength" and provide an audio signal that helps you locate the source. However, there is a "zero-cost" way of looking for leaks that is the same way used by professionals - soapy water! I simply fill a spray bottle with about 1/3 Palmolive and 2/3 water and spray the pipes/connections. I then turn ON the gas, and look for any sign of bubbles - even a small amount of gas will cause these to form. 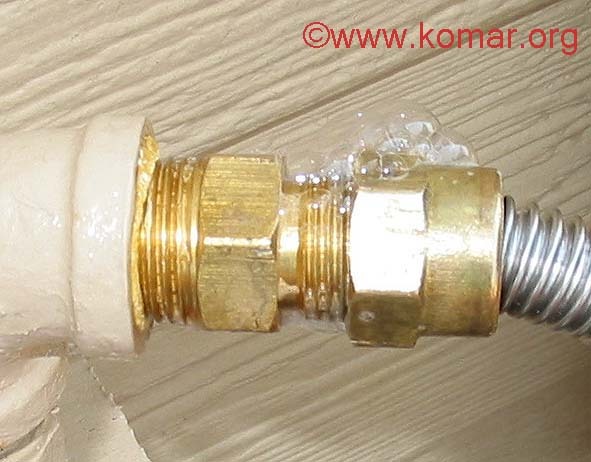 Once you have identified the leak, the solution is usually just tighting the connection. 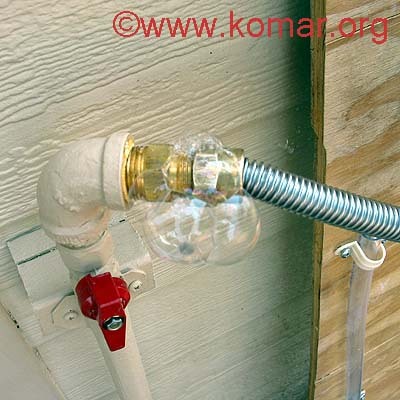 In some cases, you should put pipe dope and/or pipe tape in place seal things - definately for "pipe" fittings, questionable for flare fittings. Always be careful tightening to make sure you don't bend any pipes in the process. Spraying the Leak Detector on the back burner - hose it down! A close-up of the above picture. 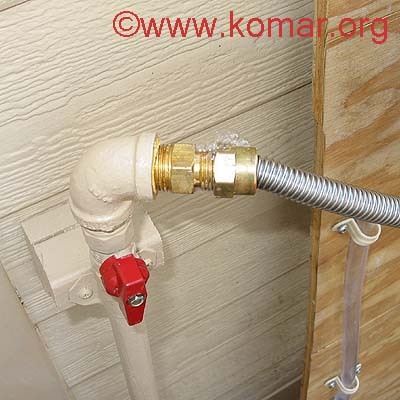 From left to right: NG from house "ends" with 90 degree female 1/2" pipe and then a 1/2" male pipe to 1/2" male Flare coupler is used to connect the 1/2" female Flare 3' flex gas pipe which connects to the BBQ grill via a 1/2" to 3/8" flare reducer. Note that I originally used a 3/8" flex pipe, but this caused enough restriction in the flow that I could not get the maximum BTU's from the BBQ grill.